Last week we celebrated a most auspicious day – the birth of 6x6! Twenty something years ago, she entered this world – who knew she would turn into such a fabulous race-running, water-bobbing, cake-eating expert? For her birthday, I wanted to make something that really celebrated her awesomeness. Something fantastic. Something more than just a cake. Or just cookies. Something that captured the true essence of 6x6 (eau de 6x6, if you will). I have, again, outdone myself. These cookies are awesome! My inspiration comes from Bakerella (genius! ), but then of course I had to add my own mocha twist to make them really really special. 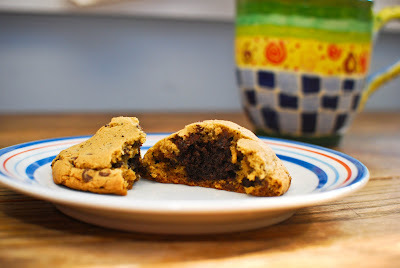 Just imagine, you sink your teeth into a big chocolate chip cookie, only to realize that a) it’s mocha flavored, and b) there’s a rich and chewy brownie in the middle! If that’s not the perfect birthday surprise then I don’t know what is. 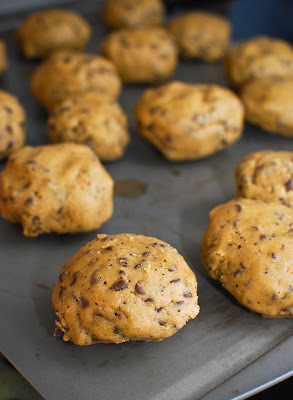 They look super-challenging, but really the recipe is just a few simple steps. 3. While the sugar heats a second time, crack the 4 eggs into a bowl, and beat them with the cocoa, salt, baking powder, coffee, and vanilla until smooth. 5. Add the flour, again stirring until smooth. Note: The original King Arthur Flour recipe includes chocolate chips. If you want the chips to remain intact in the baked brownies, rather than melting in, let the batter cool in the bowl for about 20 minutes before stirring in the chips. 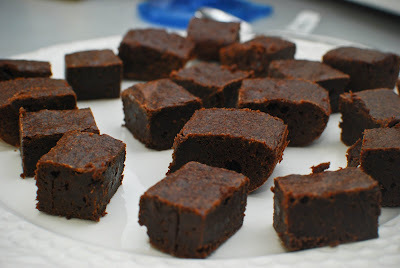 Make sure the brownies are completely cool before you cut them into about 1-inch square pieces. 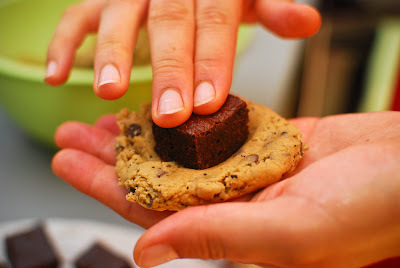 You can cut your brownies bigger or smaller, depending on how big you want your pillow cookies to be. 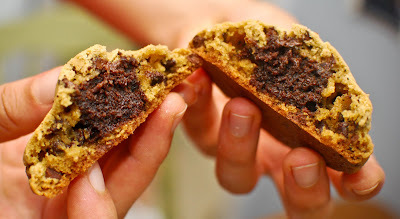 NOTE: You will have extra brownies – one batch of pillow cookies uses less than ½ pan. I’m sure you can find some way to dispose of the rest. 2. Add egg, yolks, vanilla, and coffee. Beat until smooth. 3, Add flour, baking powder, soda and salt. Stir into butter/sugar/egg mixture. Stir in mini chips. 4. Let dough chill covered in the refrigerator for at least an hour. 1. 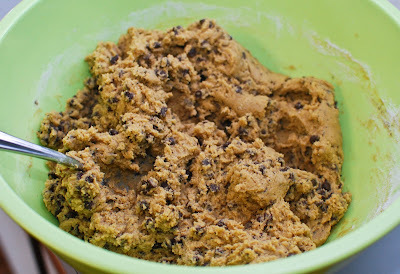 Use a spoon or your hands to scoop about 1/3 cup chunks of cookie dough. 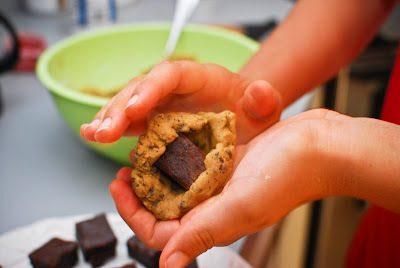 Make an indentation and place a 1 inch square brownie in the center. 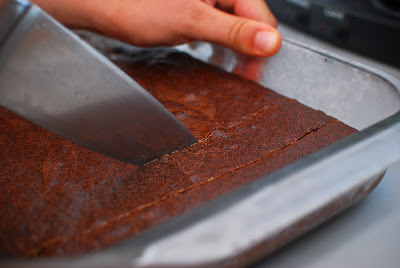 Press the brownie down gently and work the remaining dough around the brownie. 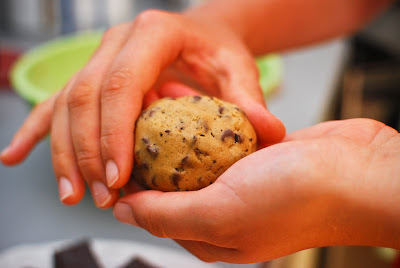 Shape the cookie into a ball. 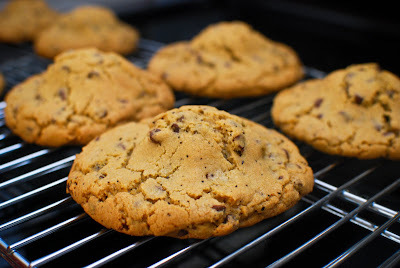 Prepare six cookies at a time using a large baking sheet (15 X 20) and bake at 350 degrees for about 18 minutes.